Thank Jobs and his genius team that we can enjoy videos and music on iPhone iPad anytime and anywhere. Wait! The largest storage of iPhone 4 is 32GB while iPad 2 is 64GB. How can they store all the 1TB and more videos on our Mac or PC? Moreover, iPhone iPad are so picky that not all of the videos on computer hard drive are playable on them, say, maybe we have MKV, AVI, FLV, WMV, etc. videos altogether (iPhone iPad only play MP4, MOV, H.264, M4V files). Wouldn't it be nicer if we're capable of simply streaming any video file to iPhone iPad from our computer immediately without considering the iPhone iPad capacity and waiting for the tedious format conversion? Of course yes. Just imagine, all of your videos are stored on your Mac or PC at home, and you access them via an app, like Air Playit, on your iPhone iPad. And instantly the capacity of your iPhone iPad becomes infinite. This is a simple solution for streaming your videos to iPhone iPad wirelessly. Air Playit is a video streaming app which is capable of streaming any videos to Apple iPhone iPad iPod touch from Mac or PC, including MKV, MP4, MOV, AVI, FLV, M2TS, WMV, etc. It is committed to realizing videos streaming instantly by Live Conversion. And the Offline conversion feature can also help you play videos on iPhone iPad when there's no network. 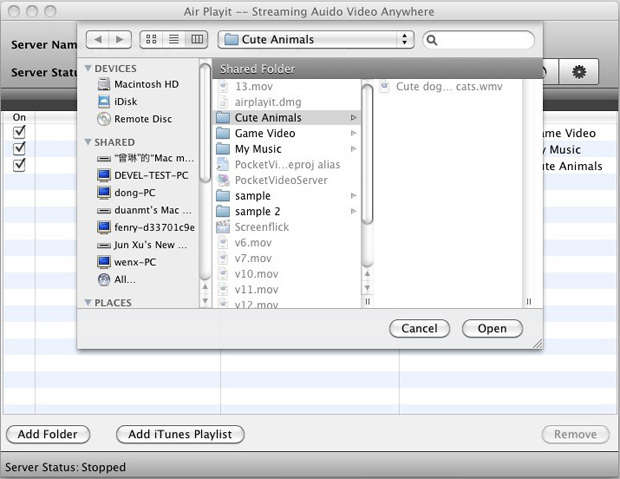 With Air Playit, you are able to create personal cloud and access video library on iPhone iPad seamlessly. How to Streaming Videos to iPhone iPad with Air Playit? Step one: Download Air Playit server. You can manage your sharing folder on server. Tips: Air Playit server will stream the videos to your iPhone iPad from the sharing folder, so you can watch videos on iPhone iPad anywhere. 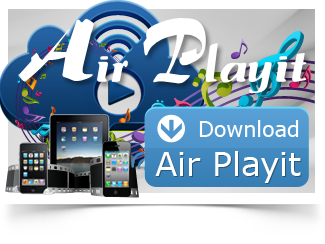 Step Two: Download Air Playit app and install on your iPhone iPad devices. Start up Air Playit on your iPhone iPad and add your computer to the server list. 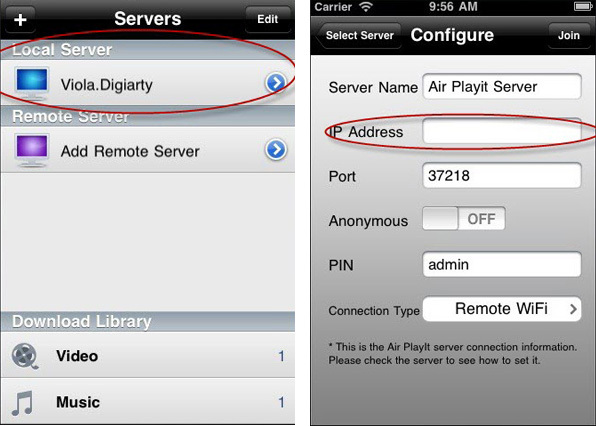 Note: Air Playit can automatically discover the server over local Wi-Fi, 3G or 4G networks by Apple Bonjour Service. If you need streaming videos to iPhone iPad over remote network, you should add the remote server to your server list by manually specifying IP address. Step Three: Streaming videos to iPhone iPad instantly. Air Playit will stream videos to iPhone iPad instantly by Live Converting via Wi-Fi-, 3G or 4G. So you can watch videos on iPhone iPad without any waiting. Besides, you can also apply Offline conversion. Now the app works as a remote video converter. 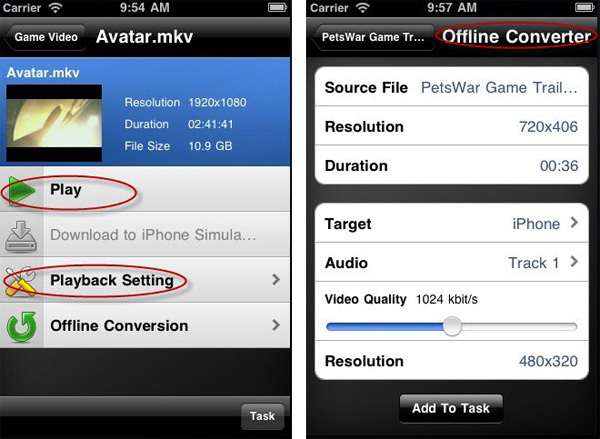 The built-in offline task manager enables you to add and manage video conversion tasks on your iPhone iPad, and then download to your iPhone iPad. So you can play converted videos on iPhone iPad later when no network is accessible (e.g. on a plane). This is totally different from traditional converter software. In addition, this iPhone iPad video streaming app is also capable of streaming music to iPhone iPad, and saving all music files on your iPhone iPad. Feel inconvenient to sync MP3 music from PC/Mac or iTunes Playlist to iPhone? Air Playit can help you put MP3 music to iPhone without sync by streaming MP3 music to iPhone iPad. What's the IN way to play MKV videos on iPhone iPad? The definitely answer is: streaming MKV videos to iPhone iPad from your Mac or PC hard drive and playing MKV videos iPhone iPad wirelessly without waiting. For Apple fans, watching favorite videos on iPhone iPad will be an extremely cool thing. Air Playit is a free iPhone iPad video streaming app that supports TV Out for streaming almost all videos to TV via iPhone iPad.